Fattoush is a Middle Eastern salad made with fresh garden vegetables and toasted bread. It’s similar in concept to the Italian bread salad, panzanella, a traditional rustic recipe using day-old bread tossed with salad and “refreshed” with dressing. 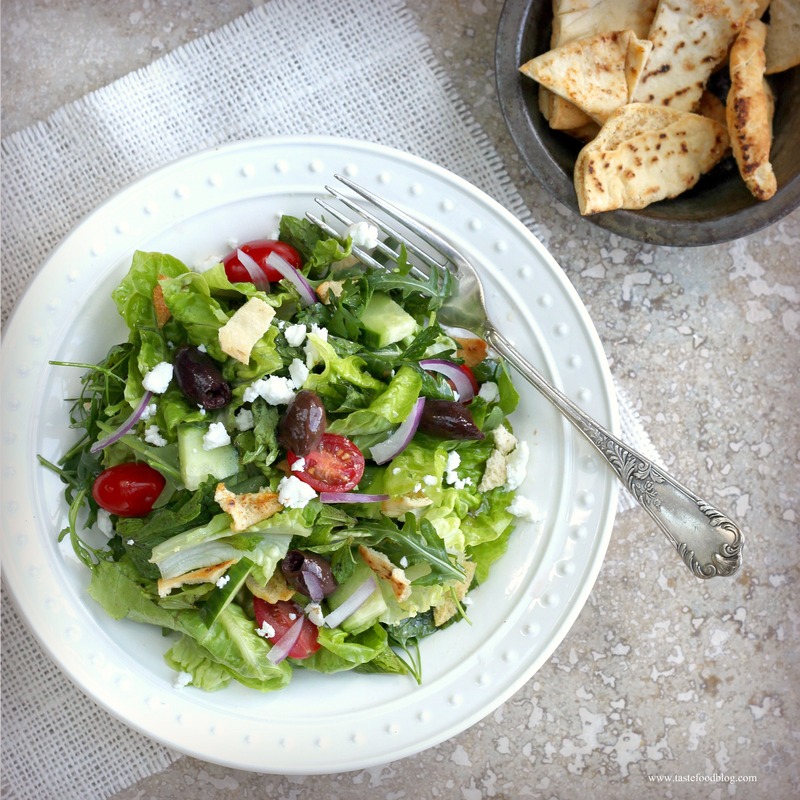 Fattoush has a significant Middle Eastern influence, with the addition of sumac which gives the salad its characteristically sour flavor, as well as feta cheese, kalamata olives, parsley, coriander, and mint. Toasted pita bread adds an addictive crunch to this salad. When the grill is going, I like to grill the pita for extra flavor. Serves 4-6 as a light main course or 6-8 side salads. Preheat oven broiler. Brush pita bread with olive oil. Sprinkle with a little salt and pepper. Cut each pita circle in 6 triangles. Toast in oven, turning once, until crispy and golden. Remove from heat and cool. Break into pieces. Toss two-thirds of the pita with the arugula, romaine, parsley, cilantro and mint in a large bowl. Scatter the tomatoes, cucumber, onion, olives and feta over the salad. Drizzle with half of the dressing and toss to combine. Add additional vinaigrette to taste. Serve garnished with extra feta.